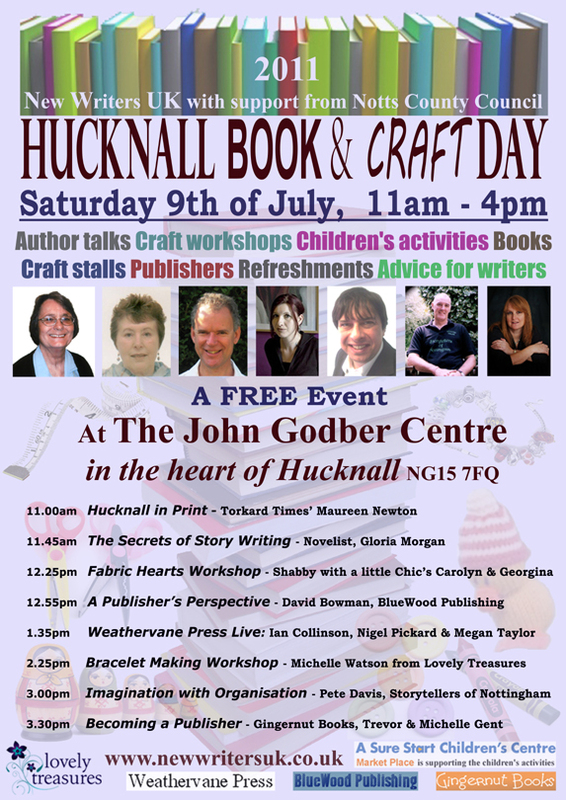 This free event is will appeal to crafters, readers, and writers alike. Throughout the day the Lovelace Theatre will feature a variety of book and craft stalls where visitors can chat to authors, writers’ groups and local crafters. Whilst there will be a series of talks and workshops (in the Byron Suite) designed to bring out your creative side. Craft lovers can make bracelets, create fabric hearts, or discover how jewellery can be made from plastic. Book lovers have the unique opportunity to hear from different publishers (including Weathervane Press), learn the secrets of story-writing, or listen to Pete Davis (Storytellers of Nottingham) discussing ‘imagination with organisation’. Children are also welcome as there will be an activity table and face-painter on hand. There is even a story-hour for the under 7s (taking place at the Sure Start centre). Local interest comes in the form of the historian, Maureen Newton, who is giving a talk: ‘Hucknall in Print: a wander through the pages of books written about Hucknall, with a look at the lives of the authors’. Refreshments and parking will be available at the centre. This event is being run by New Writers UK with support from Nottinghamshire County Council.